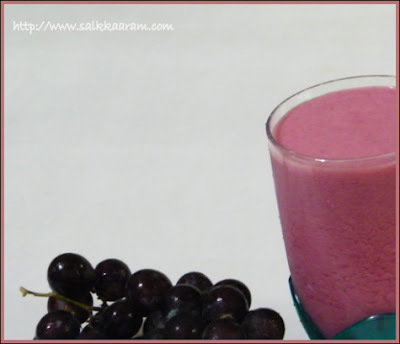 Grape Juice | Simple and Delicious ! Purple grape juice is very good for your heart! So change your 'drinking habits' and turn towards juices, especially for grape juice, which is helpful for reducing cholesterol level. Google to find out more details. Here is the way ma makes it, health watchers can avoid milk powder. Boil in 1 cup of water. Blend it with milk powder and sugar. Add chilled water and more sugar if needed. Wow lovely color, but this winter is gonna stop me from having it for a lil while I guess!!! 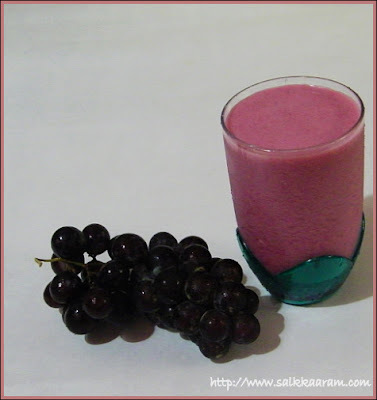 Such a healthy and tasty juice, we love to snack on grapes both red and white yum. Grape juice ottayadiku kudikuvan thonnu. Nannyittundu.